The extensive salinas are the main manmade feature of South Caicos. Abandoned today, these walls, gates and windmill ruins are remnants of bygone salt industry. There’s no single “main” spot, so simply explore. Broken down salina windmill pump, South Caicos. At the beginnings of the 1700s, salt was quite a valuable due to its common use as a food preservative at the time. British colonials from Bermuda would stop by the Turks and Caicos to gather the sea salt that naturally occurred throughout the islands for personal and regional use, but it wasn’t long before the potential for large scale production was recognized and international export began. What initially started as a simple one pond evaporation process changed overtime into a multiple stage system. Ocean water would be fed by small channels into a main pond. Wind mills, or in some cases human powered pumps, would then periodically transfer the increasingly salty brine into progressively smaller holding ponds until it crystalized. It would then be raked by hand and moved by basket or donkey cart to the dock for export. The salinas were split up with low stone and mud dividing walls and wood gates controlled water flow at the major junctions. Utilising the different stages of ponds allowed production quantities to be a bit more consistent, were easier to maintain, and reduced the chance of product loss through wall failure. Only three islands in the Turks and Caicos were actually developed to produce salt: Grand Turk, Salt Cay and South Caicos. During the height of the production years in the early 1900s, South Caicos shipped more salt than either Grand Turk or Salt Cay. At this time, about 455 acres (184 hectares) (the entire central lake) of South Caicos ponds was being utilized. The Turks and Caicos is a small country with small islands. The limited acreage of the ponds could never justify the cost to construct and maintain deep water ports and other locations (like Lake Windsor on the nearby Bahamian island of Great Inagua) proved to be far more cost effective. The industry came to a close in this country by the 1960s. South Caicos still has many ruins and remains from the salt days. Miles of salina walls, sluice gates, ocean inlets, broken down windmill pumps and abandoned warehouses still stand. 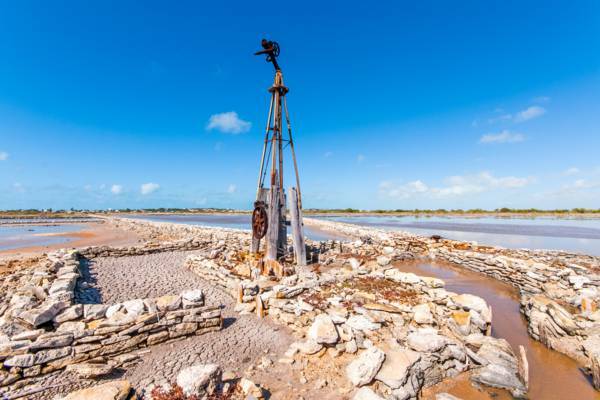 The salinas currently sit unused, and can be explored by visitors to South Caicos. Access is easiest from the Cockburn Harbour side of the salinas. It’s possible to walk out on some of the pond dividing walls to get to some old sites of windmills and sluice gates. South Caicos does have one unique feature: The Boiling Hole. This is a subterranean cave system connected to the ocean that was adapted to provide input into some of the salt ponds. Sluice gates could control and close water flow from the Boiling Hole to the salinas.